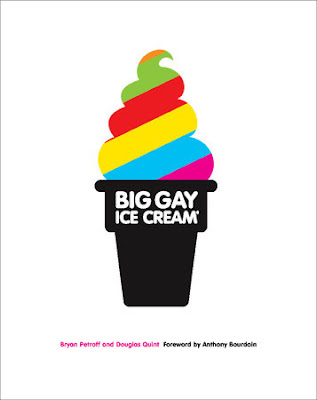 I heard a lot about The Big Gay Ice Cream Truck when it was cruising the streets of New York, but since I'm really really far away from New York, I didn't pay attention to the fact that they opened two storefronts in New York and one in Philadelphia. What I didn't miss, though, was that they had a cookbook coming out. No surprise, it's called Big Gay Ice Cream . I like ice cream. I made a lot of ice cream during warm weather. Although I'm comfortable with creating my own ice cream flavors, I also like to try recipes that other people have created. So of course I was eager to get my paws on the book. The first thing you need to know about this book is no, you didn't get a used copy of the book that people wrote in. That's part of the book design. Second is that this book isn't all about making different flavors of ice cream. In fact, at the beginning of the book they note that it's perfectly fine to buy vanilla ice cream and dress it up with toppings. The book starts with information about the history of the business, and tidbits about ingredients, tools, flavor combinations, and more. The second chapter is about toppings and sauces, the third is how to assemble sundaes, floats, and shakes. And then come the ice cream recipes. The very first ice cream recipe (after the sorbets in the beginning) shows how non-snobby they are about ice cream - it's a cheater recipe for making a fake-out soft-serve ice cream using store-bought vanilla ice cream and whipped cream. Then come the ice cream recipes. There are the usual chocolate, vanilla, and strawberry, but also some more creative ones. I originally thought I would be making ice cream from the book, the toppings caught my eye. I already made the Whisky Walnuts and the Magical Shell. When those are gone, the Bourbon Butterscotch is next on the list. Meanwhile, I'll need to buy some bananas so I can let one get a little brown so I can make the Dirty Banana ice cream. It sounds pretty darned amazing. And then maybe the milk chocolate. Just because I can never have too many chocolate ice cream recips. I like the book but I think it's worth noting that if you're looking for a book that's mostly ice cream recipes, this isn't it. If you're looking for a fun book that will inspire you have fun with ice cream, this one's just right for you. I'm sure I'll be making that magical shell often. If you're not familiar, there's a commercial product with a similar name, and this acts the same way - it's a chocolate sauce that turns hard when it comes in contact with cold ice cream. the great thing is that this one doesn't use any weird ingredients. There will be an adapted recipe from the book on Cookistry soon - probably the magical shell. You really need to make it!